Amid steadily rising tensions over North Vietnam's activities in Laos and South Vietnam, at the end of July 1964 USS Maddox entered the Gulf of Tonkin for a cruise along the North Vietnamese coast. As part of a general U.S. effort to collect intelligence in potential Far Eastern hot spots, this "Desoto Patrol" was particularly focused on obtaining information that would support South Vietnamese coastal raids against North Vietnam. One of these had just taken place as Maddox began her mission. 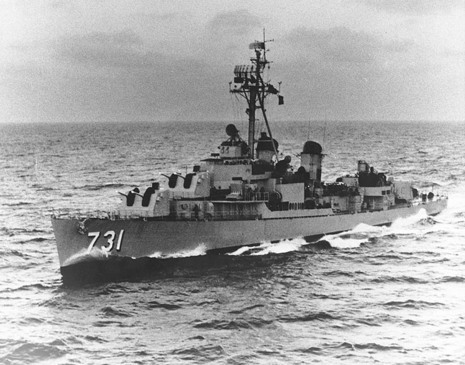 On the afternoon of 2 August 1964, while steaming well offshore in international waters, Maddox was attacked by three North Vietnamese motor torpedo boats. The destroyer maneuvered to avoid torpedoes and used her guns against her fast-moving opponents, hitting them all. In turn, she was struck in the after gun director by a single 14.5-millimeter machine gun bullet. Maddox called for air support from the carrier Ticonderoga, whose planes strafed the three boats, leaving one dead in the water and burning. Both sides then separated. Maddox was soon ordered to resume her patrol, this time accompanied by the larger and newer destroyer Turner Joy. On 3 August, the South Vietnamese conducted another coastal raid. Intelligence indicated that the North Vietnamese were planning to again attack the U.S. ships operating off their shores, although this intrepretation was incorrect. During the night of 4 August, while they were underway in the middle of the Tonkin Gulf, Maddox and Turner Joy detected speedy craft closing in. For some two hours the ships fired on radar targets and maneuvered vigorously amid electronic and visual reports of torpedoes. 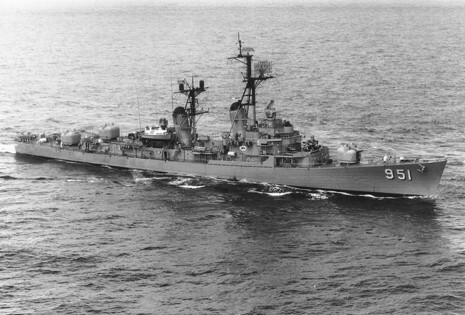 Though information obtained well after the fact indicates that there was actually no North Vietnamese attack that night, U.S. authorities were convinced at the time that one had taken place, and reacted by sending planes from the carriers Ticonderoga and Constellation to hit North Vietnamese torpedo boat bases and fuel facilites. A few days later, the U.S. Congess passed the Tonkin Gulf Resolution, which gave the Government authorization for what eventually became a full-scale war in Southeast Asia.